It took some convincing, huge thank you to everyone who lightly HARASSED Amanda at 5 Miles to Empty on her post HERE after my post HERE. Yes we had a very PUBLIC courtship. A Year ago Today we had our "First Date" HERE. 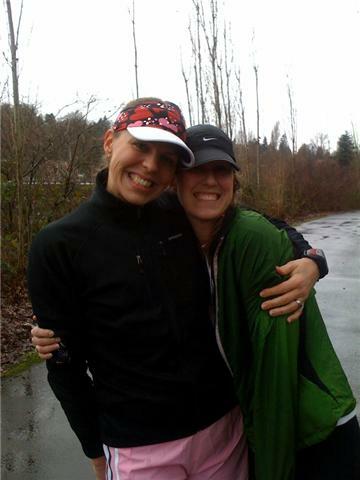 Just look at how cute and young we look :) She was my FIRST running partner, my BFF Charity was my bike training partner for my First Marathon. How Crazy is that?? From the first day I could tell we would be pals...just different enough to keep things fun. Pretty sure my uber-early ultra-planning ways could drive her crazy... but I have dabbled in what I coined "Amanda-style" racing lately.. maybe we have rubbed off on each other a bit.. So many self-portraits I could not pull them all into this post. I have been SAD for months knowing that her MOVING date was looming. Today I said "See You Soon," exactly one year to the day that we met. She does not like Goodbyes. Who knows maybe Zoe can pull out more Plane Tickets and we can all meet up and race near North Carolina?? Yep REWARDS people!! 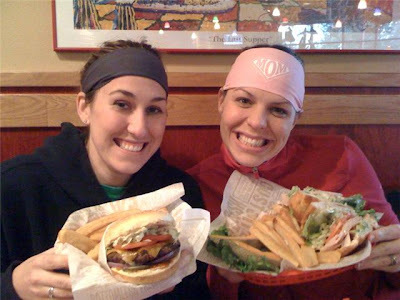 Eat up.. Amanda ordered coffee after a COLD run which tasted AMAZING.. Pretty sure every time I have a post race coffee I will raise a mug to my buddy. 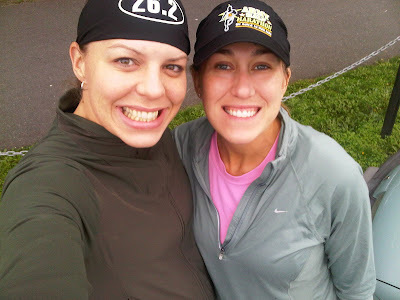 One of my favorite races was one that Amanda recommended, I had no plan but to go out and have FUN!! Before I had running buddies I focused a lot on pace, time, goals.. Friends like Amanda have helped me to realize there is much much more to running. At the end of the day your time will not matter, it is the memories you build along the path. Running friends can help you through the worst of times.. Like Mile 20 in the FREE Greenriver Marathon. It was 80++, way to hot for this WA girl, I was lonely, tired and ready to QUIT. I stopped, she said I could hop in her car....I loved the offer but we both knew I could not do that.. Seeing her for those 2 minutes (I stopped to talk) gave me the RECHARGE to keep going. And isn't that what good friends are for?? When you are down they lift you up.....you repay the favor when the tables are turned. After Miles and miles I got to know Amanda. We shared our thoughts, frustrations, ambitions, secrets... the code "What happens on the road stays on the road." What I will tell you is that Amanda is genuine, smart, empathetic, a GREAT listener, and very driven. She cares about her family, friends, community and gives without expecting anything in return. Am I sad that we won't have any more T-Town runs?? ummm well not T-Town that place is sketchy ;) but runs in general YES!! Losing a Running partner is tough, the miles will be quiet and we have one less in our TRIBE at races. I am blessed because the distance will not take away my friend. THANKFULLY Amanda has unlimited texting, which she knows I will use (she is great at interpreting bumper stickers)..
Our "See You Soon" went just as our friendship began, ON THE RUN. 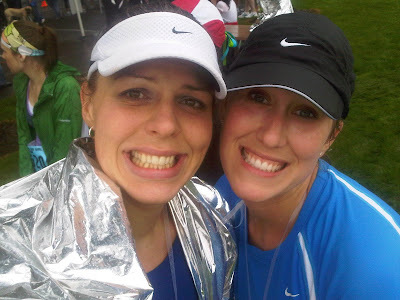 More about Portland Marathon Spectating to come this week. For now I am off to check on my friend.. Tall Mom text: "How r u feeling?" Amanda: "Starting to feel back among the living." ****GOOD thing we did not get her the casket she asked for at mile 12.. This is a really sweet post Mel. We would all be so lucky to find a friendship like the one you two share. Awww... not sappy, just nice! What a sweet friendship! 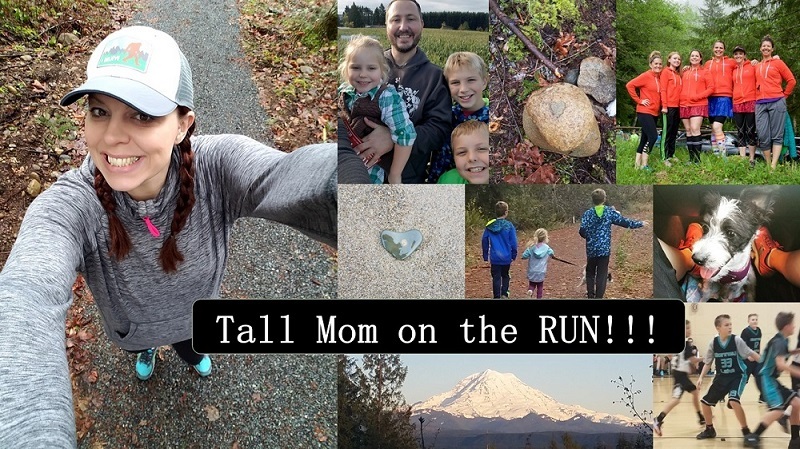 Running gives us so much! Awww... that was a super sweet post. Best of luck to Amanada and I hope that you are able to run together soon despite the distance! What a sweet post!! Love all the pics! Great post and great pics :) I'm sad that Amanda is moving and I haven't even been as lucky as you to know her that long. Hopefully you won't go long before getting to run with her again. I wish I could have gotten to know Amanda as well as you have, and even still I am totally bummed she is leaving us! I hope she knows how much she will be missed, and yet we wish her the best of luck! Awww.what a sweet post. I love countless self portraits! I hope to find my own Amanda soon. Perfect post! And, I have to say, you two are masters at the self-photo!!! Great post! Love the friendship and the photos! 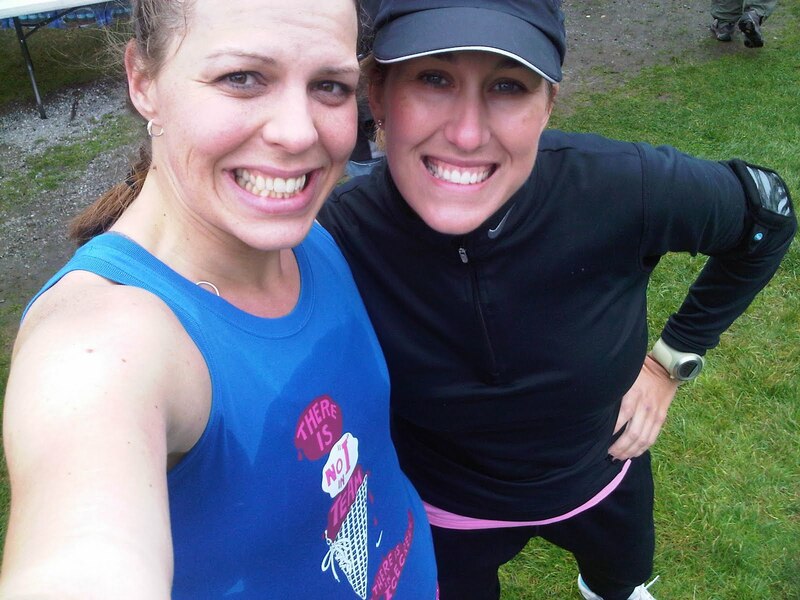 You were very lucky to have a running buddy (coming from someone who doesn't have one). Sorry to hear that she has to go! OK don't make me cry....you guys have a beautiful relationship. I love how differences can rub off. I am so thankful that we will still have 5 miles past empty and our beloved Tall Mom!! Hang in there and text text away! AWWWW great tribute to a great girl!